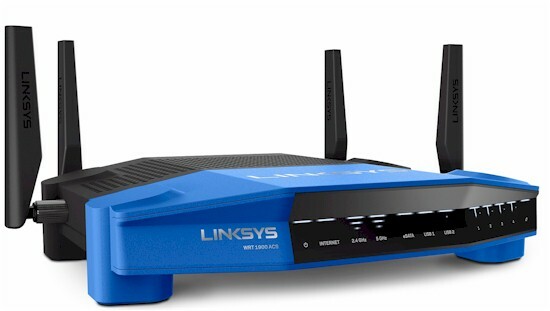 Linksys' WRT1900ACS Dual-Band Gigabit Router is the official name for the WRT1900ACV2 that was outed via firmware release notes back in April. The ACS replaces the original WRT1900AC, which will be gone when the last one is sold. From the outside, the ACS looks the same as the original. But inside, the ACS has lost the fan, upgraded to a 1.6 GHz dual-core Marvell Armada 38X processor, doubled RAM to 512 MB and integrated the two Marvell radios onto the main board. Everything else remains the same including the four-antenna design, USB 3.0 and eSATAp combination USB 2.0 / eSATA ports. The WRT1900AC review has the indicator and connector callout info. It hasn't changed from the original review, so I'm not repeating it here. Although it looks the same from the outside, the ACS' innards have gotten a major overhaul with an eye toward cost reduction and more streamlined manufacturing. The new board takes many design cues from the WRT1200AC's board. In fact, near as I can tell, the ACS' board is the 1200AC's board, with all four RF chains loaded. The photo below shows the new sans-fan layout. RF is still on the right and its "can" is no longer it topped by a heatsink. The processor / memory heatsink on the left isn't as hefty as the original's and no longer covers the components below the RF can. For comparison, here's the original AC's layout. The RF can's heatsink was removed for the photo. Removing the heatsinks and RF can tops provides a clearer picture of the main board. The two Marvell 88W8864 radios and associated components are now integrated on board. Here's the WRT1200AC's board so you can see the, uh, similarities. The original WRT1900AC had both radios on a module that was removed for the photo below. Here's a look at inside of the original AC's module. Table 1 compares the key components of the old and new designs, plus the WRT1200AC for good measure. I was able to identify switches and receive LNAs (low noise amplifiers) in the ACS' design. I didn't inspect the original AC's board, so don't know if it also has LNAs.